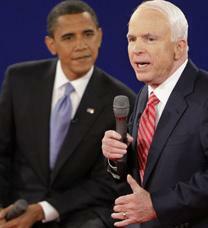 John McCain and Barack Obama debated in Nashville, Tennessee, on Oct. 7, 2008, at Belmont University. NBC's Tom Brokaw moderated the debate. Tonight's debate is the only one with a town hall format. The Gallup Organization chose 80 uncommitted voters from the Nashville area as the audience. Each audience member submitted questions in advance, and Brokaw selected the questions from those, plus others submitted by email. The candidates had not seen the questions. We expected McCain to shine at this debate. McCain's fame in the 2000 race stemmed from his regular Town Hall Forums in the New Hampshire primary. And McCain challenged Obama to a dozen Town Hall Forums over the summer -- which we expected McCain to bash Obama for, mercilessly, and McCain would have received our agreement on Obama's cowardice in not facing him at every opportunity. However, McCain did not shine. He looked physically stiff, and that physical stiffness translated, in the minds of viewers, into emotional stiffness. He wandered around the stage while Obama spoke, seemingly ignoring his opponent -- unwise when the opponent is the frontrunner. And worst, he was openly disrespectful of Obama by referring to him as "That one." Now, McCain has a good reason for looking physically stiff -- his Vietnam war injuries prevent him from raising his arms above his head. But he should have recognized that, and adjusted accordingly, by wearing a looser jacket, for example. His overly-tight jacket emphasized his stiffness. As a result, this debate MAY become a classic like the Nixon-Kennedy debate, where radio listeners thought Nixon won, and TV viewers thought Kennedy won. The same applies here -- McCain SOUNDED fine, but he looked... well, he looked OLD. McCain's "That one" phrase seemed to us more like a flub than disrespect. It seemed like perhaps McCain meant to say, "Do you know which Senator voted against it? THAT one!" but instead said, "Do you know who voted against it? THAT one!" The first version is cute; the second is disrespectful. McCain has done nothing, despite the predictable non-stop repetition of the phrase, to indicate that it was intended to be cute instead of disrespectful. Hence the record stands as disrespect -- also a bad strategy against a frontrunner. In light of McCain's poor performance in the second debate, he will need a "knockout" in the third debate. All Obama has to do is survive that largest battle, and he wins the war. McCain must win the last debate overwhelmingly, in order to get back into the race at all. Barack Obama: Not enough to help those at the top: it doesn�t trickle down. Barack Obama: I sought re-regulation; McCain boasts he�s a deregulator. Barack Obama: When Bush came in, we had a surplus; now we have a deficit. Barack Obama: Middle class needs a rescue package with tax cuts. Barack Obama: Bailout will unfreeze credit & allow businesses to function. Barack Obama: Every citizen should save energy & resources. Barack Obama: FactCheck: National debt up from $6T to $10T under Bush. John McCain: We�ve laid a $10 trillion debt on our young people. John McCain: Buy up bad mortgages so people can stay in homes. John McCain: I suspended my campaign to help resolve financial crisis. John McCain: Energy independence & tax cuts for all. John McCain: Stabilize mortgage industry so people stay in their homes. John McCain: Cut down on earmarks & establish priorities. John McCain: FactCheck: Rescue package already has mortgage renegotiation. John McCain: FactCheck: Obama�s new programs cost $286B; McCain�s $211B. Barack Obama: $15B to free us from foreign oil in 10 years. Barack Obama: Nuclear power ok, as one component of energy mix. Barack Obama: FactCheck: McCain rejected alternatives 11 times, not 23. Barack Obama: FactCheck: Reluctant on nuclear power in past; now favors it. John McCain: All of the above: nuclear, wind, tide, solar, gas, coal. John McCain: Nuclear power is the best way to fix climate change. John McCain: FactCheck: No, Obama voted for $300M oil tax INCREASE. Barack Obama: Government should invest in clean energy & green jobs. John McCain: Create green jobs to help economy & environment. Barack Obama: We�ve been reactive for 8 years; be proactive with Russia. John McCain: Ukraine now in Putin�s sights; penalize Russian aggression. Barack Obama: FactCheck: Yes, earmarks total $18B in this year�s budget. John McCain: We need a reformer because system in Washington is broken. John McCain: I fought earmarks even in defense spending. John McCain: FactCheck: Killed corrupt $6.8B contract, but reinstated it. Barack Obama: No exclusions for pre-existing conditions. Barack Obama: Health care is a right: something�s fundamentally wrong now. Barack Obama: FactCheck: Exempts small business, but no $2,500/yr savings. John McCain: Put health records online, to reduce medical errors. John McCain: Health care is a responsibility: just make it available. John McCain: Bring together smart Americans to solve Medicare. John McCain: FactCheck: Plan is $5,000 per family, not $5,000 per person. Barack Obama: Serving America doesn�t mean going out shopping. Barack Obama: Obama Doctrine: moral interest as well as national interest. John McCain: FactCheck: Pushed for immediate withdrawal from Somalia. John McCain: FactCheck: Voted against Lebanon deployment, but post-hoc. Barack Obama: Good health care and tax reform will save entitlements. John McCain: Future retirees cannot get what current ones get. John McCain: It�s not that tough to fix Social Security, if bipartisan. Barack Obama: My plan cuts taxes for most small businesses & 95% of people. John McCain: Keep tax rates the same; let�s not raise anybody�s taxes. John McCain: FactCheck: Obama voted for taxes 76 times, not 94 times. Barack Obama: More aid to Pakistan; but pursue bin Laden over their border. Barack Obama: Prevent Iran from attacking Israel, but keep military option. Barack Obama: FactCheck: Iraqis have $29B surplus, not $79B. John McCain: Bring our troops home with victory and with honor. John McCain: Don�t wait for UN if Iran attacks Israel. The above quotations are from 2008 second presidential debate, Barack Obama vs. John McCain, at Belmont University in Nashville TN.